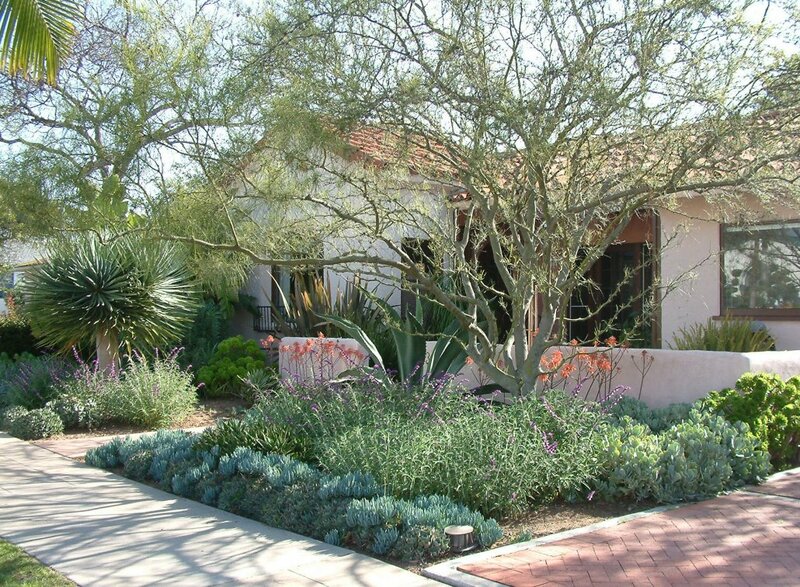 Dappled Shade, Designed by Greg Hebert Landscape Arch. This plant is fast growing to about 6'-10' tall and 8'-13' wide. Wide gray leaves have stiff terminal spines and recurved teeth on margins. It prefers full sun and well-drained situations. After blooming, which could take several years, it will die but will send up new pups from around the base. Some people are allergic to the sap. Removal is difficult if unwanted. Broad clusters of lime green flowers appear in winter and spring. These flowers create dense, round cylindrical masses! This evergreen perennial has upright stems forming a 4' tall dome-shaped bush. Crowded all along the stems are narrow, blue-green leaves. Once it's established, it is drought tolerant. Until the seeds ripen, the flower color holds with only slight fading. At that point, the stalks should be cut out at the base. Use gloves as sap is poisonous or could cause contact dermatitis.